Woman of Substance – Manisha Mundhra Beriwala – The Woman Inc.
Diwali, the Hindu festival of lights is the biggest and most popular Indian festival that occurs in the fall season, typically around Oct-Nov. We think, living in the United States, now that Presidents typically light the lamp in the White House on that day, that most people would be aware of the importance of the festival. But despite special stamps being released, getting a day off from school, or teaching children about the values of Diwali, either through stories or crafts, the awareness is not nearly where it should be. Therein, comes Manisha Mundhra Beriwala, with the single intent to change those statistics. With her trademark enthusiasm, single-minded drive, and fierce passion towards her chosen field, she is determined to make Diwali more mainstream within corporate America in the United States. Here is her story. AM: Hi Manisha, and welcome! Do tell us a bit about your background. MB: I was born in the regal Mundhra clan, an eminent business community with a prominent society-contributing lineage. I was raised in Kolkata, India with a staunch dose of Marwari doctrines, legacy and heritage. For the first half of my formative years, my self-perception was that of a black sheep, academic failure and an obsessive introvert who fumbled on every opportunity of meeting new people. Change is the only stable thing in life and with change, I somewhere found the real me who focused on a clear vision to be discovered with an obsession to create a path never thought of and to find beauty in my dark skin. AM: So why corporate Diwali? What was your strategy and inspiration behind this venture, which is now a rocking success? Growing up in India, I remember families huddled in happiness on a noteworthy high during festivities. Extended families and friends gathered lavishly around festivals like Diwali, which was my favorite festival. 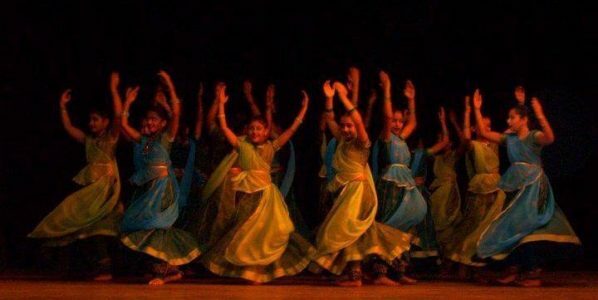 The Diwali air of trance and the joy it would bring in, the traditional home-made food, clothes and religious rituals became a dream once I moved here to the United States. I began to miss the festival celebrations back home and would often run into more and more friends and fellow Indians who would somehow share the same feelings. I felt it was my responsibility to bring us all together – the South Asian community, to re-create the same grandeur and sense of cultural belonging, which they all missed. I was on a journey to find myself and belief was my only option. Fulfillment of passion towards purpose slowly became my growth goal. Bringing together similar minded people in a foreign country was demanding me to create our own tradition. New York is now home for me, just like for many Indians residing here, who at various situations miss their original homeland for numerous reasons. The number of times the need to wrap up the present and move to the past had occurred to countless individuals and families if not for all. How will we ever be able to overcome that hollow space in our hearts and help our kids find a sense of belonging in this foreign land? As most of these highly qualified individuals tasted success in work and paychecks, an unknown force kept contributing to dissatisfaction towards culture and tradition. Happiness needed to be coordinated with belonging, and the best way to feel connected to one’s own origins is via traditions, culture and festivities. AM: That is simply brilliant! What other events does your company, MMB events do? MB: A tradition is kept alive only by adding to it. In 2017, I launched MMB events, an event management company, my own concern, with an aim to now bring Diwali to those who have been unaware of this popular Indian festival. I man a team of focused creative young heads, who bring their best in the fields of research, sales, social media, technical support, graphic design, vendor management, etc. Our focus is to make Diwali a key calendar celebration in every corporate/non corporate setup in the United States and outside India. Today Corporate Diwali represents a successful amalgamation of the old and the new. It has incorporated corporate management techniques and modern technology in a traditional family owned business model. Corporate Diwali has added top names to its Diwali celebratory festivities. From adding more families to the Diwali community over the years, now the expansion is towards professionals in various fields of expertise. The success mantra is to look at all products and services from the clients’ point of view. Top-notch quality, creativity, far-sightedness and a positive approach are the cornerstones of our business. Learning as we go along is our strength and adding value to our brand is what inspires our team further. AM: Great! So, what are the key takeaways from being an event organizer on such a grand scale? MB: An event connects people, builds communities, breeds innovation and ignites change. This organic change within communities via connections, exhibited with joy and happiness in the participants, is our fulfillment as an organizer . AM: Would you call yourself a people person? Why is that, and how do you achieve it? MB: Let me tell you – before being a people person, I am an ardent Buddhist follower. My biggest accomplishment has been completing the 10 day course at the Vipassana meditation program in Shelburne Falls, MA. It required living the life a monk with complete silence for the tenure, no reading, no writing, no iPhones, and no gadgets of any sort within a 12 hour meditation period each day. Buddha’s teachings tell us that one moment can change a day, one day can change a life, and one life can change the world. I have imbibed these teachings truthfully. This has helped my journey towards these goals, which has been successful only by connecting with people. Belief in humanity, huddling with similar mindset individuals and the amazement of love received is my feed. With every celebration the joy is impeccable. AM: Do you think you have a niche in this business and how did that happen? MB: Yes, I do believe so. Over these 11 years, I have organized multiple Indian and Asian events with Diwali being the biggest, so much so that my name has almost become synonymous with it. The beginnings of these Diwali celebrations were honest and humble. We started celebrating Diwali in community halls and club rooms with common friends and the first celebration was with a mere 20 people or so. Happiness was at its peak as we partook Indian delicacies, wore our best Indian costumes and danced to Bollywood music. But this had to grow along with my self-belief and my desires. Eleven years of constant Diwali celebrations knitted thousands of families in a traditional community belt. In 2017, MMB Events helped more than 12 different organizations in the New York city area bringing Diwali to more than 5000 people. AM: What has been your most memorable party/client till date? MB: Being a mom, I feel all kids are equal! Similarly for us as a company, all our clients are equally valued if not more. That being said, our biggest outreach via one client has been Google. Organizing a 2000 people #Thecorporatediwali event in the midst of a global audience gave us our recognition in our eyes and the massive scale of the festival was clear in sight . AM: How do you get the word around? Social media or marketing? MB: An unforgettable experience in the human heart is the best way of bringing people together. This is our marketing tool. For our Diwali events of 11 years we have never printed a single flyer, banner or marketing material. Referrals are our strength and social media is our personal playground. AM: Do you use any special technology? For example, event management software etc.? MB: This year we have our team in research and data collection. Analysis of this form of service via popular software is adding immense value to our brand. AM: What makes you tick as a person, a mom and an entrepreneur? MB: Of all the titles life has given me, being a mom is my most favorite. Being my mother’s child, my dad’s replica and my sister’s protective property I lived in a cocoon of comfort – oblivious of the real world. Our father raised us with the same equality as he would raise boys and his confidence in us gave us the confidence in ourselves. He would quote, “I wish to see you in a dense forest between all odds and watch you make your way out of it”. He was training us for the the impossible and making us grow beyond our boundaries. My family in New York grew from a couple to our first daughter, Ivanka and many years later to our second daughter, Alyona. I felt I had to teach my two daughters the same ideals and values that my mother had taught her two daughters. In a world where women are still fighting our rights to be equal in workspace and family. Accompanying my husband, Rishi Beriwala, in search of a new life to the land of opportunities, USA, I brought with myself my strong cultural beliefs and values from both of these significant family names. All these cultural activities and traditions, that were so much in the face while growing up, suddenly vanished in this new country. Conversations about custom-made Indian dresses and jewelry got replaced with brand-conscious price-tags and the latest western trends. The endless served sit down prepared daily fresh meals transposed to fixing a hard-worked self made home cooked meal. The overdose of culture suddenly went completely dark and left behind a void in my heart, a gap that needed to be filled. New York a land of opportunities was feeding our hunger towards work goals, confirming our professional front of progress and heightening our ambition towards the big American Dream. It was happening . This was becoming true. But would this define our personal life too? This was a question we often asked ourselves. I truly believe that life is a sum total of the different parts we play – in our roles in the family, in our careers and in society. These are the pillars that we align together to create a wholesome life. It does not therefore mean life is full of perfection and success – rather, it is beautifully flawed and that is what keeps me going – the desire to mend, learn and grow. AM: How would you describe yourself in three short sentences? MB: I’ll answer this question via three favorite quotes of mine. “The only limit to the height of your achievements is the reach of your dreams and your willingness to work hard for them” – Michelle Obama. AM: How has your venture impacted the Indian community in NJ? This fire was breathing in me and I leaned towards spirituality, health and fitness as a compulsive breathing life system with threads of giving back and adding more meaning to the existing Diwali events happening all over New Jersey and the Tristate area. Fun and entertainment was not enough – I had to ensure there was a social cause attached as well. I introduced ‘Diwali Giving’ – tying up with a non-profit in uplifting the underprivileged kids in India. Over the years, and as part of my expanding network of Indian women entrepreneurs, I had come to realize that there were many like-minded women who had the burning desire to spread our cultural heritage within their families, social networks and most importantly in their corporate settings. These women needed to be recognized for their efforts which would hopefully keep them motivated to continue through their journey. As a result, I introduced “Diwali Women Empowerment Felicitation Awards” partnering with The Mayor’s office in Jersey City, New Jersey. These women were daily heroes and needed the recognition in my eyes. “Your Diwali your way” were new ideals I introduced which engulfed huge reform in hearts of many Indians. This was the sense of purpose I wanted to achieve. We didn’t realize how well we were knitting the community in one and how it started to benefit small businesses, start ups and established companies. AM: How do corporations view Diwali generally? And how has that awareness increased due to MMB events? MB: #Thecorporatediwali is a one stop shop for all your Diwali needs. You name it, we make it happen, you dream it and we design and draft it. We manage a board of exclusive vendors to choose from “Turns events into Memories”. It took the festival to greater heights by organizing, promoting and celebrating the festival within top rated international organizations, MNCs, small business owners, schools, hotels, hospitals and restaurants. In 2017, MMB Events helped more than 12 different organizations in the New York city area bringing Diwali to more than 5000 people. AM: Have you ever had to plan more than one event simultaneously? How did you do it? What was the result? MB: We have had experiences in planning multiple Diwali events at one time. For this I will credit my team. They transfer all paper planning into execution. Diwali occurs once a year and at one time. We pre-plan our expertise knowing the multiple event organizations tenuring in a months time. Sticking to our plan focuses our energies and helps us produce the desired quality and client happiness. AM: How do you plan your budget according to client requirements? MB: Budget is the strongest pillar for MMB Events #Thecorporatediwali. Our clients make their own budgets and we make sure we respect it and deliver more than the accepted norm. Our expertise and experience is in making all kinds of budgets work with our clients. The celebrations have to go on! AM: What do you like most about your job? How do you stay motivated when things don’t go as planned? My work is synonymous with my identity. What I create is what I become. Change is the only constant and you learn as you go is my theory. Each event we produce is uniquely different from the previous and the next. This distinct attribute makes each day a new day and each challenge a new one. It’s this distinguished characteristic which spurs me and paces me towards getting better. As an event planner, the checklist depicts a compulsory plan b and plan c sometimes. When all plans fail, which is rare, the motivation and the solution lies within the calm. AM: What parting words would you like to give to other women entrepreneurs, who might be just getting launched or struggling in their respective fields? MB: Read, read a lot. I learn a lot by reading biographies, success stories and the like on the internet. Listen to motivation speakers – make it a daily routine to be inspired, either by TED talks, Oprah, Sadhguru, whoever your favorite Guru is. And finally, embrace your journey. Living a life paycheck to paycheck is the norm. Break the cycle and go ahead with your dreams – it is not going to be easy, it is going to leave you dissatisfied. Pick up that feeling! The minute you acknowledge that unfulfilled part of your life is when self-growth begins. Never ignore the zeal in you – push yourself towards a certain goal that your body, mind and soul envision, and don’t ever stop – because that is the last option. Thank you Manisha, for sharing your story with us, and we wish you success in making Diwali a mainstream event in every country in the world. Readers, we hope you will contact Manisha for #Thecorporatediwali event in your company. More power to you, Manisha! What a wonderful piece! It’s wonderful to know there are people out there who have dedicated their lives to bringing cultural awareness in the masses. Great work Manisha!